I just love it when I stumble upon a book by accident and it turns out to be brilliant – and that was certainly the case here. I picked this up in a charity shop for £1 because the author’s name rang a bell somewhere; I guess I read a review on a blog once. It’s translated fiction, which I like; crime fiction, ditto; and the first of a series set in Paris. So, a no-brainer to pick it up then! 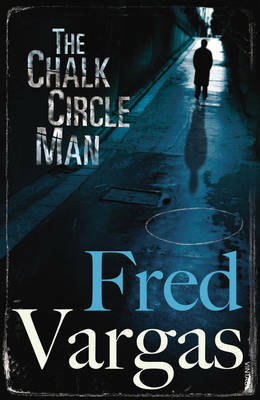 Fred Vargas is a pseudonym and the author actually has another career in archaeology (which informs one set of her novel series). This particular book, however, introduces us to a detective called Commissaire Jean-Baptiste Adamsberg. He’s a man from the country, more used to mountains and fields perhaps, than Parisian streets. Nevertheless, he’s been transferred there, to take charge of the 5th arrondissement, and there we join him. A series of blue chalk circles have been appearing on the streets of Paris, drawn round a seemingly random object, with a strange quote around it. The media of course pick up on these, and it’s seen perhaps as a joke. However, Adamsberg thinks it is anything but, and is unsurprised when a dead body turns up in the middle of a circle…. I’m not going to say too much about the plot, but I will talk about the characters, because what a wonderful bunch they are! In fact, unusually the book opens with two of these meeting – and they’re not the detective, but Charles, a brittle blind man and Mathilde, a spiky and independent oceanologist! These two figures feature prominently in the plot, and one of them has an unexpected connection to Adamsberg. Then there is Clemence, the strange old woman who helps Mathilde with her work and lodges with her. The police are a varied bunch too; particularly appealing is Adamsberg’s sidekick Danglard, who is a single-parent father of two sets of twins and a younger child who isn’t even his, and is usually drunk by lunchtime! Fred Vargas – somehow this is how I visualise the character Mathilde! The mystery itself is wonderfully satisfying, full of twists and turns that I never saw coming but which nevertheless in hindsight I think I *should* have picked up! The final resolution is excellent too, but dominating the story, and somewhat unexpectedly, is the character of Adamsberg himself. I say unexpectedly, because he is actually a *very* odd person. He seems almost detached from anything at all; and his way of investigation is quite unusual, particularly when contrasted with Danglard’s. The latter goes entirely by facts, eschewing so-called detective instincts because of a mistake in his past. Adamsberg, however, seems to go by instinct alone – he seems unable to consciously think out a case, or do any typical detective deduction. Instead, he works by feelings and emotions in almost a zen state. He just *knows* something or someone is bad and that something is going to happen. The author’s portrayal of this is quite brilliant, particularly when it starts to rub off on some of the more officious members of the team who suddenly seem to be very relaxed! All in all, this was the perfect crime book for me: murder, but not too gory; mystery, which I didn’t get; a wonderful ensemble cast, really well written; and an enigmatic detective. I shall *definitely* be reading more of Fred Vargas!